Young and professional: The Danish newcomers are killing it! After three years of intense multi-tasking with rehearsing and composing as well as doing promotion and booking by themselves, Danish rockers FOREVER STILL totally deserved to be signed by Nuclear Blast just before the release of their debut album. An album around the concept of depression, anxiety and coming out stronger on the other side. Combining two previously released EPs with new songs, the band’s fist full length effort consists of ten tracks and three almost equally long “acts”. The final act (the four newest songs of the album) lyrically deals with the more positive outlook of the person struggling with the strong emotions of the album’s story. An unforgettable voice on catchy melodies and heavy riffs. Musically, “Tied Down” has a hard and heavy nature, while remaining melodic and dark. Its straightforward sound and arrangements are accessible and even catchy. It all becomes even more impressive, when we discover that every instrument is performed by talented multi-instrumentalist Mikkel Haastrup, who also handles recording, mixing and mastering. Maja Shining‘s voice is a unique and great-fitting complement to the music, with her clear and powerful singing and brutal screams. The vocalist makes the most of her wide vocal range, constantly varying both tonally and stylistically. The upbeat ‘Awake The Fire’ invites to get up and dance, as Shining’s voice sounds very much rocky and stoner-worthy. ‘Scars’ gets instantly stuck in my head and even makes me wish I could growl like the Dane, only to sing along. The opener also reminds me a lot of early FLYLEAF, although Shining’s voice is way more powerful when singing clean. Her vocals can also interpret more styles in a very dramatic way. 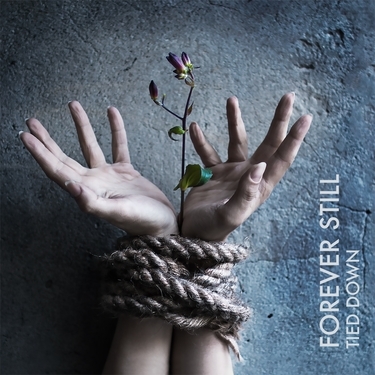 Shining and Haastrup seem to have found really good live musicians, too and we’re very looking forward to seeing FOREVER STILL live soon, after “Tied Down” comes out October 21st 2016. Are you looking forward to the debut of Danish newcomers? What’s your favorite song so far? Let us know in the comments! ‹ Epic Metal Fest 2016 – Tilburg, The Netherlands (1-10-2016)	› Winter Is Coming… DIY yourself a candle holder!